From left: Rep. Kenny Marchant, member of the House Ways and Means Committee; and Luis Dávila and Diego Sánchez, of PRFAA. 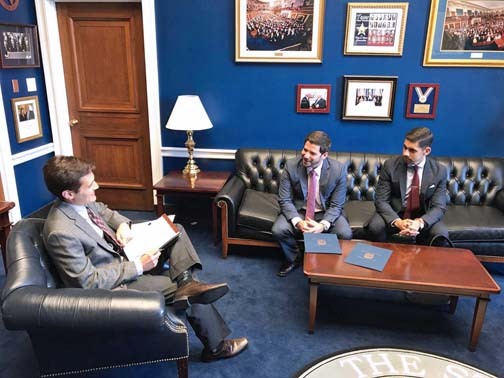 From left: Tax Counsel for Congressman Kenny Marchant, member of the House Ways and Means Committee; and Luis Dávila and Diego Sánchez, of PRFAA. The Frente por Puerto Rico’s subcommittee on tax reform on Tuesday visited 11 U.S. House and Senate offices asking for Puerto Rico’s inclusion in the federal tax reform. The group, led by the Puerto Rico Federal Affairs Administration (PRFAA) and the Office of the Resident Commissioner, included former Gov. Aníbal Acevedo-Vilá, as well as members of the private sector, and the island’s legislative branch, among others. Achieving a federal tax reform was one of President Donald Trump’s campaign promises. The local group told members of Congress that Puerto Rico seeks to insert itself into any discussion, legislative vehicle or proposal seeking to amend or reform the federal tax code. “Puerto Rico can not be considered after the reform is approved. We need to be part of the legislative process from day one, so that we are treated fairly and equitably to the states,” said Jorge Socca, director of the United Retailers Association Board. Members of the Frente Por Puerto Rico met with several members of the House Ways and Means Committee, Congresswoman Michelle Lujan Grisham of the Budget Committee, and members of the Committee on Transportation and Infrastructure. In the Senate, they met with Senator Claire McCaskill. Hey Buddy!, I found this information for you: "Frente por PR continues to lobby DC lawmakers". Here is the website link: https://newsismybusiness.com/frente-continues-lawmakers/. Thank you.